Bangkok (Thailand) – September 19, 2018 (travelindex.com) – The Department of International Trade Promotion, Ministry of Commerce, launched a new digital tool so-called Thai SELECT Application that facilitates Thai cuisine lovers in overseas to quickly locate and access to authentic Thai food restaurants at their fingertips. The application development program is aimed at rising numbers of customers and promoting business opportunities for the Thai SELECT awarded restaurants following Thailand 4.0 Policy which focuses on creating a value-based economy that is driven by innovation. Mrs. Chantira Jimreivat Vivatrat, Director General of the Department of International Trade Promotion (DITP), Ministry of Commerce, said that DITP is working towards a vision to promote Thailand’s position as the world’s leading food producer and exporter and to be listed in the world’s top ten food suppliers. Part of the missions is to ensure that Thailand can deliver food products and services which are up to the safety, hygiene, and international standards based on principles of food sustainability and food security in accordance to the Thai government’s ‘Kitchen of the World’ strategy Year 2016-2021. Meanwhile, the DITP recently developed the Thai SELECT Application, an online tool to promote business opportunities for awarded restaurants under the Thai SELECT program. The application allows smartphone and tablet users to locate the awarded authentic Thai food restaurants more easily. The development of Thai SELECT Application is in line with Thailand 4.0 Policy which strategically focuses on innovation, a tool to transform the country into the value-based economy. Currently, there are more than 20,000 Thai restaurants worldwide. The DITP’s effort to promote Thai restaurant business is aimed at raising international recognition of Thai food, enhancing sustainable demand of Thai food in the worldwide market, and adding value to Thai food exports including food ingredients and related restaurant products. The ongoing effort supports the government’s policy to strengthen the country’s agricultural sector and enhance Thailand’s position as the ‘Kitchen of The World’ supplying international buyers with quality agricultural food products, authentic Thai cuisine, and total services for Thai food. The Thai SELECT program is operated by the DITP, tasked with expanding Thai food business in overseas. Thai SELECT is divided into two are Thai SELECT Premium that will be granted to the restaurants serving authentic Thai food of premium quality with luxury decorations and outstanding services, and Thai SELECT which will be awarded to restaurants serving fine authentic Thai food. The program is a seal of approval granted to Thai restaurants and processed Thai food products. The objective is to increase the recognition and encourage Thai restaurant operators, food producers, and chefs to raise the quality of their products and services while maintaining authenticity. Also, the program is considered a channel to promote products of Thailand such as tableware and restaurant decoration items. “DITP has been focusing on the capability development of Thai restaurant operators and professionals in Thai food business. DITP provides support through different programs including knowledge training and a platform to promote business opportunities and professional connection. The development of Thai SELECT Application is another DITP’s effort to support the Thai restaurant business in all dimensions. 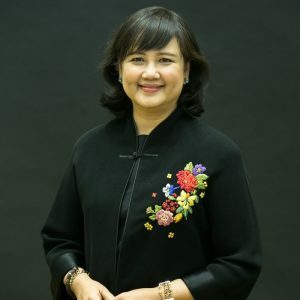 The online tool will help to promote the products of Thailand and the sustainable competitiveness of Thai restaurants in the international market which will eventually contribute to the Thai economic system.” Mrs. Chantira, said.